Most people think of Medieval costumes as being of a specific style and a specific period. However, the Medieval period actually covers six centuries of clothing: from the 1000s through the end of the 1600s. It encompasses the garb of both peasant and gentry, and runs the gamut from very simple, practical clothing to extremely ornate and decorative clothing. It covers European and Far Eastern clothing, including the lands of Russia, China, India, and Northern Africa, as well as the European and Scandinavian countries. A lot of latitude (and longitude) is covered by the generic label, "Medieval clothing." Before looking into Medieval costumes, consider your purpose. If you are going to a one-time party or masquerade, you can get away with a less authentic costume than you could if you were planning to join the Society for Creative Anachronism (SCA) or a similar historical society. For Halloween and costume parties, you need not worry so much about footwear, undergarments, or authentic textiles. For reenactments and historical society meetings, however, you must be observant of all of the niceties of the period. If you want an authentic look, you must be aware of the fiber, weave, and colour of your garments. Authentic fibers are natural ones, primarily wool and linen. Hemp was also used, and cotton and silk were available to the upper classes. Both twills and tabbies were common, with some decorative weaves such as the lozenge twill and geometric brocades. Plaids and stripes were also becoming common in this time period. Contrary to popular belief, not everything was grey, brown, or white. However, very bright colours were generally not available. For authenticity, stick with earth tones and jewel tones. Anything coloured with a natural plant dye, such as madder, indigo, or yarrow, will probably be acceptable. 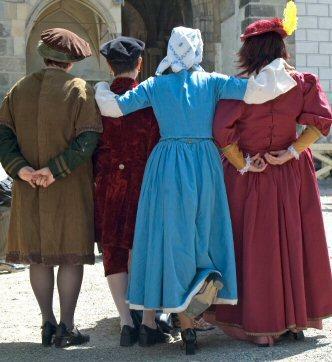 Unlike the real people of the era, we can choose our social station when deciding on a Medieval costume. Clothing for the peasants was far simpler and more practical than clothing for the upper classes and royal court. If you are looking for a costume that is quick to assemble and does not require a lot of unusual accessories, go for the peasant look. If you are trying to impress someone, or if you like to really dress up, go for the royalty. All Men: Depending on the era that you wish to portray, you will wear either a knee-length tunic or a shorter one, with hose (opaque tights or leggings), boots, and a belt. Doublets (padded jackets) came into fashion in the 1500s and 1600s. All men wore codpieces of various types and sizes, depending on station and era. Peasant Men: Most peasant men wore pants. They should be dark-coloured and baggy, cross-gartered with bands of cloth, and with the tunic worn on the outside. The "poet" shirt or peasant shirt will work well if you are not aiming for absolute authenticity. Men of the Gentry: The garb in early Medieval times for the gentry was quite similar to that of the peasant, but more ornate, with decorations at the hem, neck, and cuffs of the tunic. Gentry generally wore hose, not pants. In the 14th century, the cotehardie became common, followed by the houppelande in the 1500s. In the late 1500s, the tunic became shorter and shorter, until it barely protruded from under the belt at all. During this time, the chest portion of the man's tunic was pleated and stuffed to give a more robust appearance. Shoes had incredibly pointy toes, and some had to be held up by a garter at the knee so that the wearer could walk without tripping! If you are planning to dress for the Tudor era (1600s), think of the portraits you've seen of Henry VIII. He was quite a fashion-conscious man, and would be a good model to follow for that era. Peasant Women: Think of your basic "wench." A peasant-style blouse (or full chemise) that ties at the neck, a bodice to lift and accentuate the bustline, and a full, floor-length skirt are the basics. Women also wore hose and shoes. Peasant women generally wore wooden shoes. Women of the Gentry: This is where Medieval costuming gets fun. Women's fashions changed dramatically from the tunic, cotehardie, and houppelande of early medieval times, to the elaborate multi-petticoated gowns with starched ruffs, tight corsets, and farthingales of the 1600s. Women also had various headdresses, ranging from the simple coif to the the elaborate hennin or the amazingly elaborate headwear made popular at the French court. The well-dressed woman in the 1500s would have worn the following layers: shift and knickers, at least one petticoat, an overdress (often a kirtle), and a headdress of some sort. Hose and shoes would have completed the ensemble. In the 1600s, her outfit would have included a corset and either a "bumroll" or farthingale, depending on whether it was derrieres or hips that were in fashion. Undergarments: It should be noted that there were no brassieres in Medieval times. The tightly fitted bodice of the cotehardie, or the chemise with a corset or bodice, were used to lift and support the feminine figure. The cotehardie is a specific type of tunic: for men, it is a long-sleeved, thigh-length, belted tunic worn with hose; for women, it is a long-sleeved, fitted, buttoned gown with close-fitting, buttoned sleeves. The cotehardie is tight-fitting through the torso, and flares below the hips. It is very popular among all medieval enthusiasts for both a basic costume or for layering under other garments. The kirtle is a sleeveless, boned overdress for women, sometimes with a solid skirt, sometimes with a skirt that is open in front. It is worn over a long chemise. The houppelande was worn in many European countries during the 1400s and 1500s. It was a long garment with very long, elaborately lined sleeves. It was worn over another garment such as a tunic or cotehardie. The coif is a simple, close-fitting cap worn to cover the hair. Both men and women wore coifs either alone or under more elaborate headgear. The hennin is your typical princess hat. Think tall cone-shapes with long veils drifting off of the back.